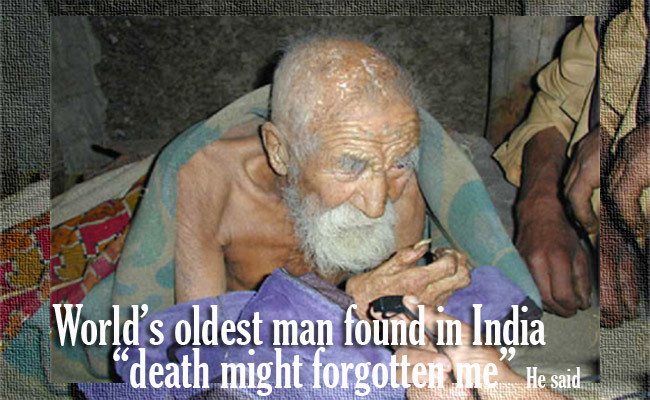 Home Entertainment Guinness World Records News Oldest Man in the World World’s Oldest Man Found in India:"Death might forgotten me"
World’s Oldest Man Found in India:"Death might forgotten me"
If you are wondering who could be the World’s Oldest Man then he is found in the holy city of Varanasi which is known as one of the oldest cities in the world in Northern India. His name is Mahashta Murasi who is a cobbler at the city until he retired in 1957 when he was 122 years old. There is also a record that he lived there since 1903. According to the Guinness Book of World Records, he was born in 1835 which makes him 179 years old now. His birth date was before the fight of India for their Independence in 1857 and before American Civil War. When Murasi was interviewed, he revealed that death might forgotten him cause he’s been alive for a longtime that even his great grandchildren died years ago. He also thinks that he might be an immortal cause a normal person can’t even reach 150 years old but he will just enjoy his life. His claims were proven by his identity cards and birth certificate but there is no medical certificate to confirm it cause the last doctor who visited him died in 1971. News about Murasi spread around the world and became a hot topic in countries like Portugal, Spain and Italy. worldnewsdailyreport.com first reported it but some doesn’t believe it yet cause the site is known for their fictional articles. World News Daily Report on the other hand insists that they did not create the picture cause it circulated online for a long time. The picture also became a meme on various sites but the original source of the picture was unknown. Netizens were also not sure if Murasi is really 179 years old cause it’s an exaggeration. The last person that was reported to be the oldest person in the world was Jean Calment from France at an age of 122 but unfortunately died in 1997.